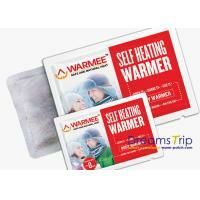 Disposable instant heat pack with the Self heating Patches give warming to you. Ingredients Iron powder, Activated carbon, Vermiculite, Water and Salt. Storage Keep in dry, cool place and avoid exposure to sunlight. Open the outer package and expose the pack to air. Remove the paper back and adhere heat patch to the clothing. Dispose of used pouch with regular garbage, it’s natural ingredients are environmentally safe. 3. High quality pressure sensitive adhesive, Eco friendly protection, safey, No clothing injury. NEVER use it when you sleep. HOT FEELING is not sensitive). Because above people's sensory nerve ending is lower sensitive to hot, so when above people use warmer patch, they must be careful. When children, old people, people who could not look after himself, use warmer patch, other adult should look after them. If the product touched the eyes, please use clean water to wash, and go to hospital at once.If eat the product by mistake, use emetics method and go to hospital at once. Store the product in dry place, avoid direct sunshine. Put the product in theplace where children can not reach. Do not always use warmer patch on the same position. (e.g. today use it on area A, then tomorrow you should not use the warmer patch on area A again, you should use it on area B.
DreamsTrip™ SCIENCE & TECHNOLOGY CO., LTD located in Suzhou, is a professional manufacturer and foreign trade supplier belong to SUZHOU HENGRUN GROUP. The company is engaged in the development and manufacture of steam warming eye mask, all kinds of sleep travel eye masks, heat paste, heat patch, warm pads, detox foot pads, foot patch and so on. The product has reached the medical level. DreamsTrip™ always focus on providing good quality and competitively price products with excellent services to our clients. DreamsTrip™ have professional R&D and QC team, always keep ourselves updated with market trends. We are committed to introducing the latest products and services to the market. Quality has reached the international standard. All kinds of Eye Mask: Disposable steam eye mask, Electric USB eye mask, Silk sleep eye mask, Cooling gel mask, Travel eye mask and Newborn phototherapy mask. All kinds of Warm Patch: Warm foot pad, warm patch, toe warmer patch, shoulder warm pad, and other styles. All kinds of Detox Foot Pad patch: Kinoki style, gold style, super gold style, Natural Bamboo detox foot patch and other styles. OEM and ODM business will be highly welcomed, we have the experience of working with big brand companies and have top-class production line to meet your requirements for quality and delivery! We DreamsTrip™ sincerely invites customer in China and abroad to develop health and beauty care business together creating a great prospect!